A famous name in grilling is bringing another winner to the arsenal of tools that you should have in your backyard. The Weber Performer Deluxe Charcoal Grill, 22” model 15501001 is a fabulous model to add to your backyard patio or deck area. At less than $400, this grill offers a round 22-inch bowl for your grilling needs that is porcelain coated and provides over 330-square-inches of cooking space. It is a great addition to your BBQ’s on the weekend or fire it up during the week for delicious meals anytime. The Weber name is synonymous with grilling and this new model is no different. One of the less than exciting things about grilling with charcoal is removing and cleaning up the ash after you’re done. In some grill models, this can be a cumbersome task that is put off until it is impossible to put off any longer. However, with the new Weber Performer Deluxe Charcoal Grill, this is not an issue anymore. This model features a removable ash catcher that is a high-capacity unit and is constructed out of strong aluminum. This means you can easily hold a larger amount of ash before you have to dispose of it. The unit provides an easy way to get rid of your ash pile without causing issues to your grill. Simply remove it from the bowl, empty it out, and you’re ready to go for your next grilling cycle. Many of the features provided with the Weber Performer make it a simple to use the grill for the whole family. The patented Electronic Push-n-Go igniter makes it easy to light your grill and get to cooking as soon as possible. There are other features such as the painted table that provides you with a sleek, stylish look to keep all your grilling tools close at hand. A thermometer is built-into the lid where you can easily keep a watch on how the temperature inside the grill is doing without having to lose heat in opening the lid. Tool hooks are also attached on the side to help you keep all your spatulas, tongs, and more within reach when you’re in the throes of grilling your favorite steak or burgers. 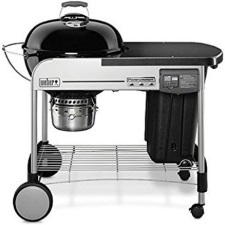 At the writing of this particular Weber Performer Deluxe Charcoal Grill, 22”, there were 197 customer reviews on the Amazon website. The overall rating for this model is currently 4.6 out of 5 stars available. There are over 183 reviews on this model that are in the positive category, raving about all the wonderful top aspects this grill provides. There were only 14 critical reviews about this Weber model. Most issues were concerned around missing pieces that were not included during the shipping process. Some of those were critical pieces that they could not use the grill till they were received. Other complaints included were the difficulty in removing the ash pan and also a “hole” in the cooking grate that was not functioning properly. Overwhelmingly, however, this grill is highly rated by most people who have had the opportunity to use it. Those in favor of the grill stated … “Great grill for temperature control” … “So far, so good” … “Best customer service ever” … “I’m very happy” … “Top quality grill”. In closing, if you’re looking for an all-around top-quality grill, the Weber Performer Deluxe Charcoal Grill, 22” model, is a great selection. It provides ample cooking space, storage area, and easy to use lighting systems, as well as ash removal. From the CharBin container for storage to the metal table for prep work, this grill offers all the features you dream about when you’re wanting a new grill. Consider this model for your next backyard BBQ to cook for your friends and family.